New York City has the largest parking garage market in the country. The majority of the city’s parking garages use prior generation metal halide and T-12 energy-inefficient lighting that not only costs more to operate and maintain, but is now subject to federal lighting bans. A new recent change to NYC law now requires that all parking garage owners benchmark their energy use, making it readily apparent which ones have upgraded to energy efficient lighting. Once benchmarking is in place, environmentally, energy, and cost conscious visitors will be able to avoid inefficient garages by using hand held devices that can reference the publically reported benchmarking results. By retrofitting their lighting to more efficient fluorescent, induction, or LED lighting, garage owners can pass their operating expense savings on to their customers, thereby giving them a comparative advantage. Parking garage owners and operators should consider federal EPAct tax savings when planning for lighting upgrades, as these savings will significantly reduce the installation costs of lighting retrofits. Under current law, EPAct parking garage deductions are available for both new and existing building lighting projects completed between January 1, 2006 and December 31, 2013. Each of the three major parking garage lighting technology alternatives have strengths and weakness that need to be evaluated. Items to consider include investment price point, utility rebates, building environment, lighting performance, operating costs, lamp life, warranties, dimming characteristics, and maintenance costs. To date, fluorescent lighting, utilizing T-8 and T-5 lamps, has been the most common product selection for energy efficient lighting. With fluorescent lighting conversions, density of fixture layout is critical to minimizing energy use and maximizing EPAct tax incentives. Without attention to design, we see some projects that miss tax deduction or only achieve partial tax deduction. Fluorescent installations generally have the lowest installed price point of the three major lighting technologies. LED or Light Emitting Diode lighting is moving quickly into the parking garage marketplace. There are many competing vendors and product offerings, and garage owners need to research and compare product offerings. 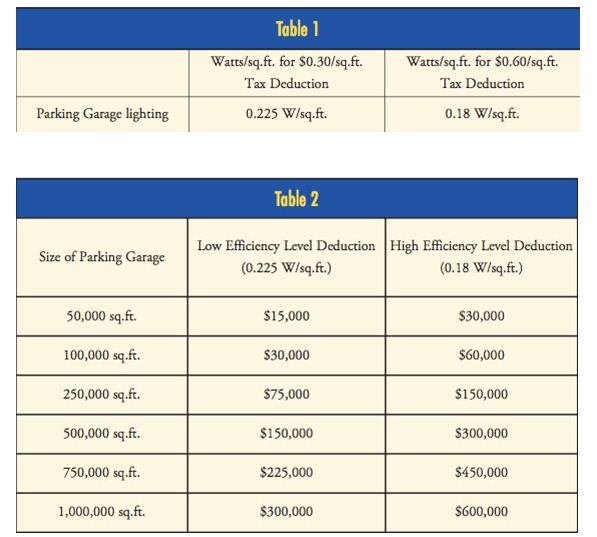 Due to the low wattage level, most LED parking garage projects qualify for the maximum EPAct tax deduction. Some projects are right on the edge of eligibility, however, so it is important to have an EPAct-knowledgeable reviewer make the calculation. In an interesting market development, induction lighting — although available in the U.S. for over ten years — is enjoying high growth in the parking garage market albeit from a relatively small installed base. Now that parking garage owners have two distinct product alternatives in fluorescent and LED lighting, they seem to be more open to compare and contrast a third lighting alternative. Induction tends to have a price point in between fluorescent and LED and has its own particular attributes warranting evaluation. Induction lighting is actually fluorescent lighting without electrodes and is sometimes called electrode-less discharge lighting. Prescriptive rebates are a fixed amount per product such as $30 per fluorescent fixture. Prescriptive rebates are common with high volume mature product categories because utilities are thoroughly familiar with the product’s energy performance results. Accordingly most utilties offer fluorescent rebates based on a prescribed amount available from a prescribed table or listing. Custom rebates are tailored or customized to the product’s expected performance and are normally calculated based on the electricity expected to be saved. Hence, custom rebates for electricity-based products are sometimes called kW(kilowatt) rebates. Many utilities are not yet familiar or supportive of LED and induction lighting products, so the exclusive rebate opportunity may be a custom rebate. Since LED and induction lighting is low wattage lighting, a probing into a custom rebate may lead to a dialogue resulting in a much higher overall rebate than the typical prescriptive process. Many parking garages still have mainstream prior generation energy inefficient metal halide and T-12 lighting. As of January 1, 2009, probe start metal halides are illegal to manufacture in their most common wattage categories. T-12 magnetic ballasts are now illegal to manufacture as of July 1, 2010. As replacement costs for these banned items increases, parking garage owners will naturally retrofit to one of the three efficient technologies. There are a wide variety of commercial garages where either the garage owner or a tenant/garage management firm can obtain the EPAct tax deduction benefit depending on who paid for the energy efficient lighting. Typical commercial garage owners include commercial city garages, commercial airport garages, apartment buildings, office buildings, department stores, hotels, and casinos. With government-owned garages, the design team is entitled to the EPAct tax deduction. For tax purposes, a designer can be an architect, engineer, lighting designer, design and build contractor or an ESCO (Energy Services Company). It is important to note that by statute, the tax beneficiary is the designer and not the government entity. The government owner reaps the larger economic benefit, which is the permanent perpetual energy cost reduction. The parking garage lighting designer or design team earns a onetime tax incentive for designing an energy efficient facility. No later than May 1, 2011 all New York City buildings that exceed 50,000 square feet, or multiple buildings on the same lot that exceed 100,000 square feet, need to be annually benchmarked for energy and water use. The law requires benchmarking by major individual building categories, including parking facilities. It will be the garage owner’s responsibility to gather the information and report it on the online database system provided by the United States Environmental Protection Agency (USEPA). This system, which is organized by what is called ESPM (Energy Star Portfolio Manager), will rate building’s energy usage in comparison to other benchmark buildings in the nation on a percentile scale of 1 to 100 (1 being the least energy efficient building and 100 being the most energy efficient building). After the first year of the collection of energy benchmark for buildings, it is the owner’s obligation to continue with mandatory benchmarking rules annually within the month of every January. Fortunately the benchmark data input process is relatively straightforward and all the information is disclosed to the public, so comparisons can be made and contrasted to other garages that are similarly situated within the city. The owner, in order to improve their garage’s energy performance and lower their energy consumption, can further strategically utilize energy benchmarking. What is particularly important is that the results of the benchmarking process will rapidly become integrated with existing websites that track the rates of parking garages around the city. Websites such as nyc.bestparking.com, Google Maps, and autoparking.com all offer drivers the chance to search parking garage prices in advance on their computer or, increasingly, on their cell phone. As energy benchmarking is disclosed, these websites may include information about energy efficiency alongside pricing information, so that customers who so choose will be able to park at the most energy efficient garages. These garages may also draw more customers if they lower their prices with the new lower operating cost. According to one directory of Manhattan parking garages, there are 103,000 licensed, off-street parking spaces in Manhattan. New York parking garages range from the tiny (the one at 324 W. 11th St. has just 7 spaces) to the enormous (the garage at Pier 40 that has 3,500 spaces). Larger, multi facility garage owners like Icon or Central Parking will be able to use their economies of scale to purchase LED’s at lower price points than smaller owners who operate only a handful of locations. They are also ideal candidates for large prescriptive utility rebates. Lastly, LED garage projects typically qualify for the highest level of tax savings. With the sheer volume of large parking facilities in New York City, parking garage owners have a tremendous opportunity to realize energy and tax savings. Sophisticated clients seeking environmentally friendly, affordable clients will increasingly rely on websites that inform them of prices and energy benchmarking results. Garage owners should act now to be ahead of the curve, particularly, if they want to attract today’s customers. Charles R. Goulding, Attorney/CPA, is the President of Energy Tax Savers, Inc., The EPAct 179D Experts, an interdisciplinary tax and engineering firm that specializes in the energy-efficient aspects of buildings.